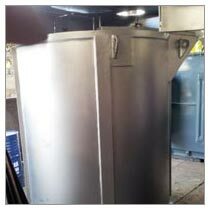 We are a prominent Manufacturer, Supplier and Exporter of Salt Bath Furnace from Mumbai, Maharashtra. Salt Bath Furnace designed by us is made from quality materials which ensure smooth operation and high efficiency. Corrosion resistant and durable, our Salt Bath Furnace is popular all over the world. We have a team of highly skilled professionals who cater to any issues raised by the customer across the globe. We are capable of delivering of Salt Bath Furnace anywhere in the world within the promised time.